"People are looking for change and they are realising that the only way to achieve that is through the Conservative Party. Rob Earl is the latest in a long line of former Liberal Democrats coming across to the Conservatives." “It is now clear that only the Conservatives can replace this hopeless, dithering Government. I have been impressed by the changes being made to the Conservative Party and, here in Wirral, their refusal to do any kind of secret deal with Labour. Indeed, the decision by the Liberal Democrat councillors in Wirral to prop up this failing, two-star Labour Council was the final straw. It’s time for change, not ‘more of the same’,” added Rob. "Today’s Conservative Party is more green; more family-friendly, and more committed to giving power to local people. We are a modern and moderate party that wants to improve the quality of life for everyone and believe in social responsibility, not state control. 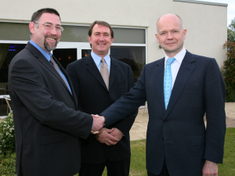 I’m delighted to welcome Rob and look forward to working with him here in Wirral." A longstanding Labour councillor in Fleetwood has also defected this week.